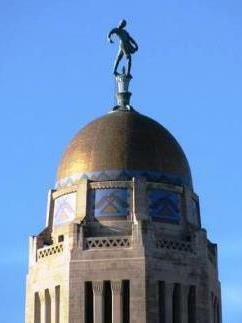 Linda Burton posting from Lincoln, Nebraska – Look carefully at my picture of the Nebraska state capitol. Do you notice anything unusual? I thought it was nice that free parking is available close by, and a sign at the bottom of the steps shows the open hours and the ADA entrance; that’s unusual, but not what I’m referring to. 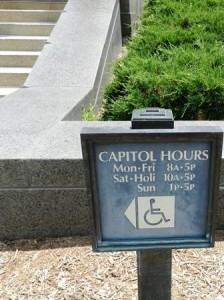 I’m talking about a feature unlike any other capitol in the United States. Thirty-seven capitol buildings have domes and four are skyscraper-highrise in construction. But the Nebraska capitol fits into both categories! A domed highrise, unique and striking. It’s not the tallest of the three built in the 30’s when economic considerations were primary and Art deco was the design of choice, nor was it the least expensive to build, but it incorporates features that meet the needs of Nebraska citizens with both efficiency and beauty. And behind every element that is functional lies a deeper meaning of what Nebraska is all about. Take that golden dome, for instance. It is symbolic of the sun, so central to the weather of the prairie state; its reflective surface even changes color as the weather changes. Below that, the frieze around the drum depicts thunderbirds, an American Indian symbol of thunder. Atop the dome stands the Sower, arm extended as he spreads the seed in a northwesterly direction, where most of Nebraska’s farmlands lie. These three elements together represent weather and agriculture; symbolically, they are an homage to civilizations of the past – Egyptians, American Indians, and the European settlers. From top to bottom the theme carries through, yet all the spaces are usable, and logically arranged. But it’s not just the building that’s unique, it’s also what happens inside. I’m talking about the legislative system – the only one in the country that is unicameral. Unicameral supporters also argued that a bicameral legislature had an undemocratic feature in the committees that reconciled House and Senate legislation. Votes in committees were secretive, and sometimes provisions were added to bills that neither house had approved. The capitol building was completed in 1932, constructed over a ten-year period in four building phases. Total cost was just under $10 million and the new building accommodated the executive, judicial, and legislative offices of the state. The Senate was housed in the east chamber, the House in the west. It was 1934, partly due to the budgetary pressure of the Great Depression, when Nebraska citizens ran a state initiative to vote on a constitutional amendment creating a unicameral legislature; the amendment was approved. The House of Representatives (the lower house) was abolished; the two became one. The Legislature meets today in the west chamber; that space was chosen because it is larger. The unicameral body also has changed committee rules; bills can contain only one subject, and must be given at least five days of consideration. 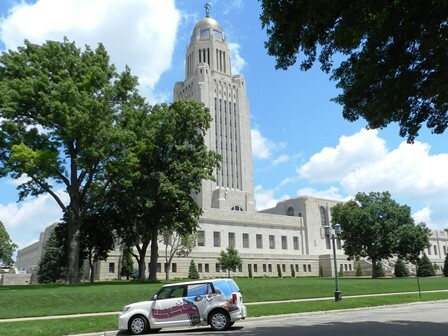 The Nebraska state capitol also enjoys a regional distinction – it is the tallest building in Lincoln, and Chapter 27.56 of the Lincoln Municipal Code will keep it that way; it places height restrictions on structures within the Capitol Environs District. Common measurements list the capitol at 400 feet, including the Sower at the top (making it the second-tallest US statehouse; Louisiana’s capitol is 450 feet). In total, there are 15 full floors in the capitol (three mezzanines also exist within the tower). The 14th floor, Memorial Chamber, is the highest publicly accessible level. At this level, four observatory decks offer views of Lincoln from 245 feet above the ground. The structure is anchored by a three-story, 437-foot square base. This square base houses offices most frequently visited by the public. The second floor (main floor) is home to the Nebraska Supreme Court, the Nebraska Court of Appeals, and the Nebraska Legislature. From the center of this base, the gold-domed tower rises. Beautiful and functional; two for one, and very special. Note: the construction story and inside art will be featured in a separate post.